The Official MCI Mail Blog ! 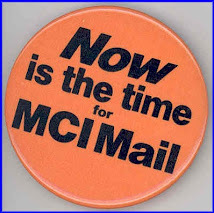 A blog about the former email service known as MCI Mail. The videos you see above were sourced from a VHS cassette (½ inch magnetic tape) that was originally produced in 1984 for the MCI Mail sales organization. The image quality is rather poor because the actual video tape is now over 25 years old, and consumer VHS magnetic tape normally starts to degrade within 10-25 years. If anyone happens to have a copy of the broadcast/studio tape of these ads (which was probably recorded on 1-inch tape) please let us know. Also - thanks go out to Kathy in Chicago for making it possible for us to post these ads on YouTube. It was her tape that we used as the source of the ads. Other Events from the Past . . .